Robert Frost once said, “I took the road less traveled by, and that has made all the difference.” Jim certainly took a road not traveled routinely by visitors from the west, to arrive at this Vietnamese market where he has creatively captured this amazingly colorful detail. This resplendent print, besides being a terrific, eye-catching photograph, would make a powerful advertising image for any manufacturer of cloth or thread, especially in the far-east. The lovely lighting and high camera viewpoint emphasize the awesome, unrivaled colors and designs of the costumes and related apparel. The highly colorful designs are just awesome in their visual diversity and extended range of hues. Every color that one has ever seen is here, except for white, which is only barely visible if one looks hard enough for it. Apart from the wonderful diversity of colors and designs in the traditional clothing that these ladies are so proud to be wearing, there are two other important facets of this great print that I must mention. Firstly, although the marketplace is extremely crowded, there is a definite sense of order and intensity. All eyes in the foreground and center of this photograph are directly focused on the young lady who is intently holding a bolt of cloth from the display on the floor. One can almost sense the dialogue and price-bargaining that is going on between the lady and the vendor. In the background, the people are orderly milling around, intent on maximizing their own market opportunities to the fullest. Secondly, Jim has strikingly complemented the incredible patterns radiating throughout these lovely costumes and head coverings, with the visual patterns the people themselves make in this intense crowd scene. 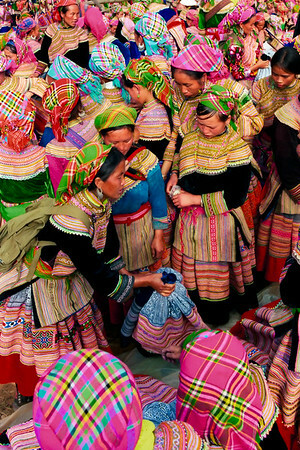 One’s eyes can travel and weave intricate arrays, reflective both of the people and with their costume designs, all combining to make a stunning image in what is probably a typical market day in this striking area of rural Vietnam.